Linking up with Megan for Dear Monday! Dear Monday, Holy exhaustion. I needed a caffeine IV/drip fixated in my arm today. Dear Blogging Break, You were totally unintentional but not at all surprising considering my level of exhaustion lately. See above. Dear Kitchen Upgrade: I cannot tell you how much of a weight has been lifted knowing that you are complete. I have been admiring our countertops for over four months now, but because the backsplash wasn't done - I didn't feel like I could completely enjoy them. As of yesterday, I can. Now, if we only had appliances that matched. Ho hum. Dear Baby Peters, Only 10 more days and we will know if you are a boy or a girl. Let me tell ya - the suspense is killing me. Dear 19 Weeks, My tummy is slowly expanding and rounding. This very well be my last week in regular pants. Bring on stretchy waist bands and forgiving panels of elastic. Dear Hubby, I can't thank you enough for all of your hard work on the kitchen... Or for your kindness in the fact that this was all my grand idea and I was completely useless throughout the whole endevour. 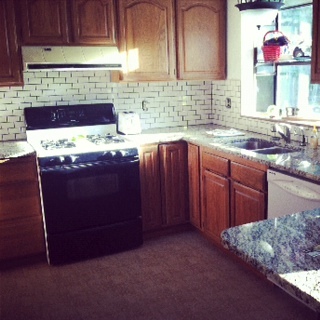 I'm cooking up a countertop-saga post that shows the great kitchen transition over the last four months. I know you are just drooling with excitement, but hold your horses. Loooooove the new kitchen!!! Ryan did one heck-of-a job! I LOVE the backsplash, Laur! So pretty! Boy or girl?! I can't waaaaaiiiiiit! Will you be finding out on August 2nd? We'll be finding out on August 3rd! So exciting!